Held in your physical body are densities that are epigenetically passed on from one generation to the next. This is known as transference. What is now understood is all traumas and pains are carried throughout each lineage until one person is ready and available to heal and complete the cycle inherited for future generations. You know you want to serve humanity, awaken your healing abilities and heal yourself and your family. You know it’s time to deepen your commitment to opening up your spiritual gifts by releasing the pain and trauma that is passed down from one generation to another. You want to change the cycle of pain and suffering, and it’s obvious you are the one who can make the changes for future generations and your children. There is a powerful connection between the mystic, the initiate and the depth of wisdom women hold within their lineages. Women have gathered in communities all over the world embracing & honouring each others unique talents and gifts. Only in the last 5,000 years has this intricate web of wisdom & ancient knowledge been siphoned off from her to deliberately dis-empower her greatest gift; her connection to the mystical dimension of her ancestors. I invite you to explore your Spiritual Gifts while being supported through your awakening. Change your current circumstances for your children, your health, your heart and your soul. Support humanity and evolution through Generational Healing™. You want to know how to harness your healing abilities and open up to new dimensions of awareness. You desire to learn how to heal at the very core of the DNA, see into new dimensions, connect in multiple realms and hear the body’s intelligence. You are seeking a mentor to apprentice with, someone who has the experience, knowledge, and wisdom to take you by the hand and show you how to open up your Spiritual Gifts to the world. That opportunity is available to you now. A deepened sense of gratitude and connection to your heart. New level of trust and confidence in yourself and your intuition. A more humbling understanding of how trauma affects your lineage as well as more compassion for your family, friends and people in your life. Feeling more present, safe, and grounded within your body. The ability to be more honest and authentic with yourself and others. A greater connection to your own ancient bloodline and the ancestors that have been asking for healing. A more expansive and trusting relationship with Earth. A new offering to serve your clients and support the healing of humanity. A practical application for using your spiritual gifts. Training on how to use Generational Healing™ and create your own business as a Generational Healer™ & Spiritual Guide. 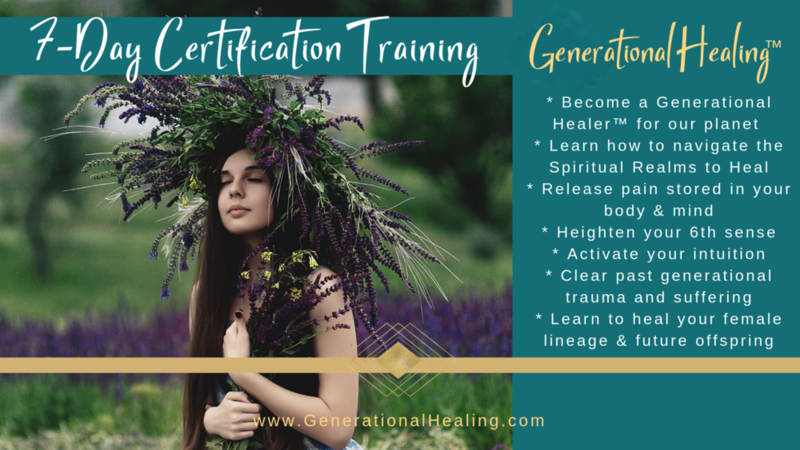 If you would like to become a Certified Generational Healer™ and begin serving humanity, I will be offering several live 7-Day Training Certification in Generational Healing™ this year. Your first step is to enrol in The 13 Mystical Wisdom Teachings Apprenticeship Training Online presented by Deborah Skye, founder of Generational Healing™ and supported by me. After you complete the 13-weeks of initiation work to ripen, ignite and open your spiritual gifts to trust your intuition, you will be prepared to enter in the 7-day certification training in Generational Healing™. How to facilitate a Generational Healing™ session. Learn how to work directly with the Ancestors to help in the releasing of stored densities in the bloodline. How to support the ancestors to promote healing on Earth. What it means to be a Generational Healer™ & Spiritual Guide in the context of this body of work. What you can do daily to deepen your connection to your own ancestors. You will both receive and facilitate Generational Healing™ sessions giving you the opportunity to experience healing personally and practically. Only 2 spots remain available. Must begin pre-requisite by March 6, 2019. Must begin pre-requisite by June 15, 2019. Must begin pre-requisite by August 1, 2019. Calling all women who feel they are healers, sages, souls of the ancient ways, seers and story tellers. You are the wise women who are awakening to your ancient lineage. Your body is remembering her powers, she is asking you to step into her spiritual gifts. I’ll be hearing from you soon! Vanessa Benlolo is a professionally trained and licensed Generational Healing™ Teacher & Spiritual Guide under the on-going Guidance of Deborah Skye King, Founder of Soul Therapy School® and Creator of Generational Healing™. Generational Healing™ was received over four-years of initiation work at a Maya Pyramid in the Peten Jungle of Guatemala from 2008-2012. It was here in the ceremonial center that the Ancestors delivered a message to share with humanity; to heal the density of trauma still stored in the generational lineages that reside in your bloodline, to assist humanity and our Earth, so we can all move into the next evolution. Going through the 13 Mystical Wisdom Teachings and Generational Healing Training changed the way I function, the way I relate to the world and, most importantly, the way I relate to myself. It gave me a new level of awareness and allowed me to go in deeper into my own healing process. I finally feel like my energy is my own and it is okay to keep it that way. Training to become a Generational Healer™ was a life-shifting experience. It is a privilege and honour. Vanessa’s devotion to her love of Generational Healing™, her deep feminine strength and gentle support, compassion, and unconditional love for all things supported me through different emotional changes. Vanessa is professional, friendly, soft, educated, kind, grounded, patient, and caring. I received the gift of freedom, self assurance, healed deep heart ache, sadness, and gained ability to trust in my own wisdom and knowing. My guidance system has been awakened! Training to become a Generational Healer™ has taught me the personal meaning of true service. Because, service to the ancestors is facilitating healing for them and Mother nature and this gives me a purpose with connecting to all things. Connecting to my heart daily and living out my day in true humility, integrity, and unconditional love. As my days unfold, I have soft, subtle, loving reminders to myself, of self love, self trust, self worth, always remain in my heart ~ it knows best! Vanessa is such a heart- centred beautiful person who exudes this energy in holding space and lovingly guiding us through the teachings of how to facilitate Generational Healing.